You rely on emails heavily in today’s technological world. 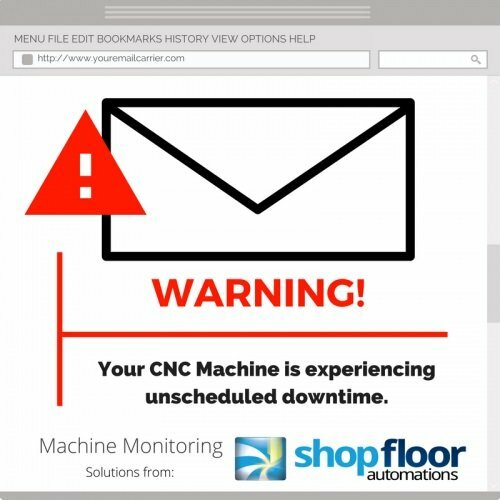 Imagine being able to receive an email when your CNC machine goes down. DataXchange from Scytec is a machine monitoring solution we highly recommend if this sounds appealing to you. DataXchange connects to your newer CNC equipment through an ethernet port, or for legacy machines and non-CNC equipment, SFA adds a hardware solution to compliment DataXChange that can monitor your machines. Configure downtimes you want to be notified about, and an email automatically sends to anyone on your specified distribution list. Set custom parameters for timing or hierarchy of the emails, too. Picture this: if a machine alarm goes off, you can set the system up to wait for a set period of time before it emails you – this eliminates an email being sent out for every small event. Or you can set it to send an email to John Smith at the company if the alarm happens during first shift, while if the alarm happens during second shift, the email is sent to Jane Doe. This eliminates unnecessary emails to people that might be at home asleep! Instant access to shop floor data and productivity is a valuable tool. Correct problems faster and increase up-time with solutions like these. Call us at 877-611-5825, send a message to our Sales team, or come find us on one of our social media channels.